How to Identify Saltwater species, Tuna, Marlin, Wahoo, Swordfish, Dolphin and Shark, Identify Grouper species, Yellow Fin Grouper, Gag Grouper, Nassau Grouper, Red Grouper and Warsaw Grouper. 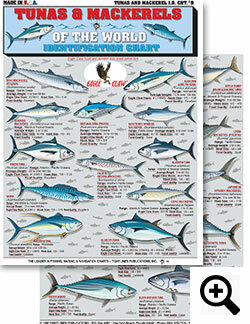 Anglers all over the world find something interesting in these saltwater fishing charts. Tightlines Charts also can be found in the New (I.G.F.A.) International Game Fish Association Museum and Library in Dania Beach, Florida. 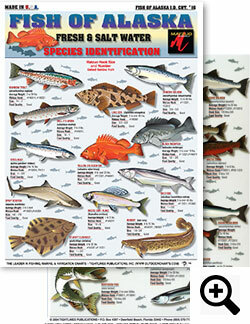 All saltwater fishing charts are 3mm Laminated to ensure 100% percent Waterproofing, and can be rolled up to fit into any tackle box. Tightlines Publications is proud to announce that they are the Leader in Fishing, Marine, Hunting, and Navigation Charts. From Bait Rigging charts to Freshwater Fishing Charts to Big Game Hunting Charts to Saltwater Fishing Charts, you can't go wrong with a Tightlines Fishing Charts at your helm. 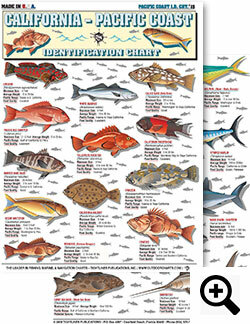 Fish of Alaska ID Chart #16 Saltwater Fishing & Freshwater Fishing chart - Rainbow Trout, Ling Cod, Chinook Salmon, Dolly Vardin, Yellow Eye Rockfish, Steelhead, Black Rockfish, Sheefish, Spiny Dogfish, Starry Flounder, Burbot, Artic Grayling, Pacific Halibut, Northern Pike, Eulachon, Chum Salmon, Pink Salmon, Big Skate, Coho Salmon and more. Pacific Coast ID Chart #15 Lingcod, White Seabass, Calico Bass, Pacific Red Snapper, Yelloweye Rockfish, California Halibut, Albacore, Claifornia Barracuda, Mahi-Mahi, Yellowtail, Mako Shark, Yellowfin Tuna, Bluefin Tuna, Swordfish and more. How To Catch EM Saltwater Chart #1 Barracuda, Permit, Tarpon, Snook, Cobia, Pompano, Cubera Snapper, Jewfish, Yellowtail Snapper, Bonefish, Kingfish, Mutton Snapper, Blue Marlin, White Marlin, Wahoo, Yellowfin Tuna, Warsaw Grouper, Nassau Grouper, Mako Shark, Swordfish, Trippletail, Dolphin, Sailfish. 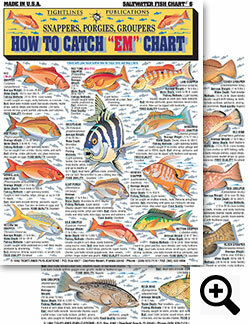 How to Catch EM Saltwater Chart #2 Black Sea Bass, Striped Bass, Bluefish, Codfish, Pollack, Fluke, Flounder, Porgy, Haddock, Weakfish, Mackeral, Red Drum, Blue Marlin, Skipjack, Bluefin Tuna, Albacore, Yellowfin Tuna, Blue Shark, Great White Shark, Bonito, Hammerhead Shark, White Marlin, Big Eye Tuna. Saltwater Identification Chart #5 Contains: 64 Saltwater Fish of the Atlantic Ocean, Bahamas, Caribbean Sea, and the Gulf of Mexico. Plus Common & Latin Name, Average Weights, and Food Quality, 64 Beautiful Color Illustrations. How to Catch EM Saltwater Chart #6 Red Toro Snapper, Lane Snapper, Red Snapper, Red Porgy, Sheepshead, Mangrove Snapper, Vermillon Snapper, Scup Porgy, Hodfish, Yellowtail Snapper, Silk Snapper, Mutton Snapper, GROUPER'S: Yellowfin Grouper, Graysby Grouper, Red Hind, Scamp Grouper, Speckled Hind, Nassau Grouper, and much more. 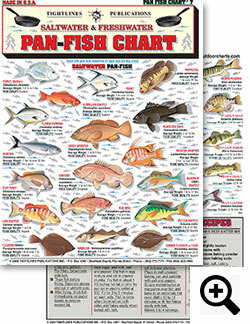 Pan - Fish Chart #7 18 Saltwater / 18 Freshwater / Fisherman's Recipes Northern Porgy, Permit, Trippletail, Vermillon Snapper, Pompano, Coney Grouper, Mangrove Snapper, Blk. Sea Bass, Hog Snapper, Bluefish, Scup Porgy, Flounder, Mutton Snapper, Fluke (Summer Flounder), Haddock, and so much more. 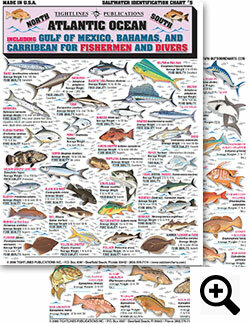 Tuna's & Mackerel Identification Chart #9 (Eagle Claw) King Mackerel, Spanish Mackerel, Monterey Mackerel, Pacific Sierra Mackerel, Wahoo, Cero Mackerel, Narrow Barred Spanish Mackerel, Chub Mackerel, Japanese Spanish Mackerel, Atlantic ( Boston ) Mackerel, Frigate Mackerel, Albacore Tuna and much more. 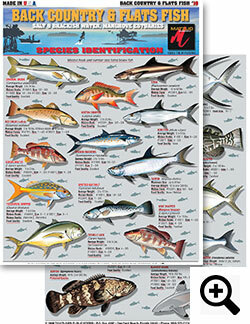 Back Country & Flats Fish ID Chart #10 (Eagle Claw) Bonefish, Redfish (Red Drum), Black Gouper, Ladyfish, Common Snook. Bluefish, Spanish Mackerel, Tarpon, Spotted Sea trout, Sand Seatrout, Crevalle-Jack, Gray Snapper (Mangrove Snapper), Permit, Pompano, Palometa, Schoolmaster, Sheepshead, Cobia, and much more. 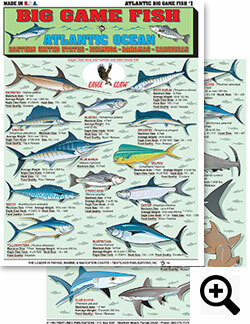 Atlantic Big Gamefish Chart #1 (Eagle Claw) Swordfish, White Marlin, Sailfish, Blue Marlin, Spearfish, Dolphin, Striped Bass, Wahoo, Tarpon, Bluefish, Blackfin Tuna, Yellowfin Tuna, Bluefin Tuna, Big Eye Tuna, Albacore Tuna, Atlantic Bonito Tuna, Dusky Shark, Big Eye Thresher Shark, Tiger Shark, and much more. 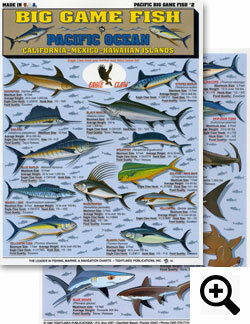 Pacific Big Gamefish Chart #2 (Eagle Claw) Swordfish, Striped Marlin, Spearfish, Black Marlin, Blue Marlin, Dolphin, Roosterfish, Wahoo, Yellowtail, Yellowfin Tuna, Bluefin Tuna, Albacore Tuna, Skipjack Tuna, Opah, Blacktip Shark, Tiger Shark, Mako Shark, Great White Shark, Scalloped Hammerhead Shark, and much more.